Paxton Big Block Mopar Carbureted **Tuner Kit** Polished [1201860-1P] : Supercharger Superstore, Your Online Source for Vortech Superchargers, Paxton Superchargers, Procharger Superchargers, Magnacharger Superchargers and Techco Superchargers! These are universal supercharger kits designed for vehicles equipped with carbureted big block Dodge 440 RB engines. Supplied pulley ratio will produce approximately 5-6 psi at 6000 RPM on a lightly modified 440CI engine. Horsepower gains (depending on boost levels, engine volumetric efficiency etc. ): 30-75%+. The supplied crank pulley is designed to work with the OEM Dodge twin V-groove accessory crank pulley. For correct belt alignment, the proper accessory drive crank pulley must be used. This universal system requires the installer to source a high volume fuel pump and a properly jetted 4150 style carburetor unit (with mechanical secondaries). Vehicle throttle cable/arm modifications may be required. 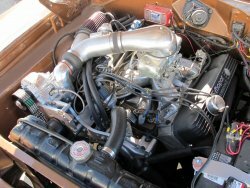 A replacement hood or hood modifications may be required depending upon the type of intake manifold and carburetor enclosure / bonnet installed on the engine.